Official benchmarks posted by Geekbench show that Apple's A11 Bionic delivers a huge jump in performance over last year's A10 Fusion used in iPhone 7, with scores that are not just far beyond other mobile ARM competitors' latest chips, but higher than the base Intel Kaby Lake Core i5 processor Apple uses in its 13 inch MacBook Pro. Unofficial A11 Geekbench scores that appeared just before Apple's event last week indicated Apple had a fast chip behind the curtains, but the newly added official scores are even higher than what leaked. Apple is using the new A11 Bionic in its iPhone 8/8 Plus models as well in iPhone X. The scores Geekbench outlines for the three models show some variation between them (less than 5 percent in single core and around 7 percent in multicore), likely related to the difference in display resolution and offset by a difference in RAM. 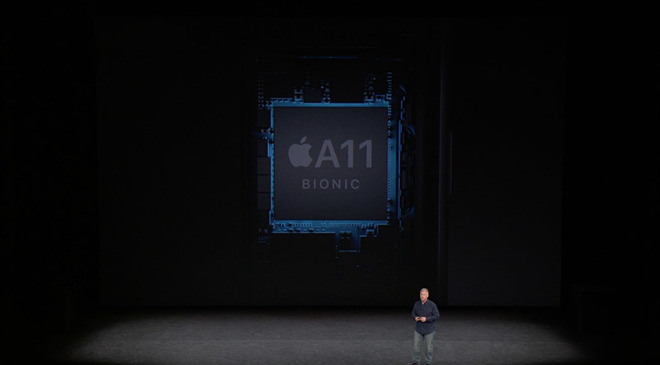 This year's A11 Bionic not just faster and more efficient, but also more capable in entirely new ways as well. 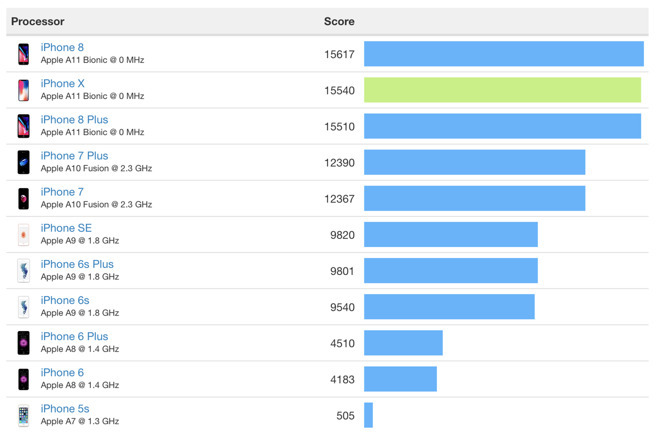 But apart from that, its generic benchmarks jump over Android flagships' ARM chips is even larger. That's to be expected because Apple's A9 from two years ago was already beating this year's Androids in typical, single core performance. Benchmark numbers don't tell the whole story. While Apple's A11 Bionic can hit numbers higher than a Kaby Lake Core i5, there are lots of things a user with a 13 inch MacBook Pro can do that don't translate to a phone. A notebook is tasked with driving a much larger, higher resolution display, for example, which lets you do things a pocketable phone can't. Higher resolutions mean there's more pixels to manage. That's also one reason why Apple's compact iPhone SE can still beat newer Android flagships with its now two-year-old chip: it has far fewer pixels. Android makers have sought to drive the adoption of extremely high resolution displays—in particular Samsung, which develops its own screens and seeks to use these to differentiate its smartphone offerings. However, as we have repeatedly noted, Samsung's incessant push toward higher resolution displays has fallen behind its efforts to include the horsepower to drive them. Rather than rushing out displays with just high pixel counts, Apple has worked to develop its SoC with the horsepower to drive existing resolution displays, differentiated primarily by other qualitative factors such as color accuracy and wide color gamut. The company hasn't changed the resolution of its new iPhone models since the larger new iPhone 6 and 6 Plus were introduced three years ago. It has, however, developed Ax chips with the extra graphics power to drive iPad and new iPad Pro models, with far higher screen resolutions than its iPhones. We noted years ago that the higher screen resolution of the iPhone 6 Plus allowed it to be beaten by the standard iPhone 6 in benchmarks; it even feels a bit slower in actual use. In addition to extra pixels (i.e., about 2 million, or twice as many as the standard iPhone 6/7/8), "Plus sized" iPhones internally render a 3x display resolution (as opposed to the 2x render that Retina Display iPhones have performed since iPhone 4), then perform a 1.15x downscaling of the internally rendered display to match the actual Plus screen resolution. The new iPhone X changes this. Like the Plus, it also renders internally at 3x but it now natively delivers this to its display. So even though it has over 2.7 million pixels (nearly triple the pixel count of iPhone 6/7/8), it doesn't have the performance hit of downsampling. Paired with three years of Ax chip advancements, iPhone X appears to be fully capable of driving its higher screen resolution. In contrast, Samsung's Galaxy S8 uses an incredibly high resolution screen with more than 4.2 million pixels, but is paired with a chip that can't keep up, giving it benchmarks about in line with cheaper Androids from Huawei and Xaiomi that have much lower screen resolutions. That's certainly not helping Samsung to stay relevant in the important Chinese market, where there's a fixation on benchmark numbers--and where Apple has an overwhelming 80 percent share of premium-priced phones. Both the Qualcomm Snapdragon SoCs that Samsung uses in most of its international models and its own homegrown Exynos chips (which it uses in places where Qualcomm's CDMA isn't needed) have lagged behind Apple's pace of silicon progress. The Ax-Exynos gap is particularly notable, having grown into a wide chasm since the two phone makers last closely collaborated on the Hummingbird/A4 chip design back in 2010. How has Apple managed to beat Samsung at chip design, given that Samsung owns its own fab and was experienced in mobile silicon for many years before Apple debuted its custom A4? Because all of Apple's new iPhone generations use its latest chip, that massive volume of sales spreads around the expense of developing new silicon. 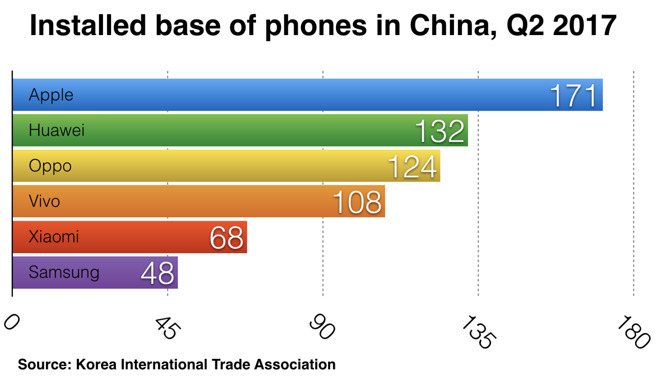 Apple sells around 170 million latest-generation iPhones in their first year. Apple also continues to use each Ax chip generation for multiple years of iPhones; uses the same processors in its other products including Apple TV; scales up each year's iPhone chip technology for iPad and scales it down for use in products like Apple Watch. Samsung, along with every other maker of custom-designed chips (including Huawei's Hisilicon subsidiary and its Kirin SoC), has a far more limited potential market for the custom silicon it creates. Despite designing and building Exynos SoCs, Samsung largely makes use of Snapdragon chips from Qualcomm in its phones. And outside of Apple, the markets for tablets or smartwatches—particularly high performance, expensive ones—are extremely small. Even Qualcomm, which services many leading vendors of Android phones and enjoys a monopoly in intellectual property required for compatibility with mobile networks, is having a hard time competing with Apple in performance, not purely because it doesn't know how to, but because most of the demand from Android makers is for lower-end value chips, not state-of-the-art, advanced SoCs. It can't afford to develop technology that nobody wants to pay for. That indicates that Apple enjoys not just a temporary head start in designing silicon until its rivals can catch up, but rather an inherent lead tied to vast economies of scale that allow it to invest liberally in developing faster, more efficient processors using technology that that can scale up and down for use in a variety of devices. In addition, Apple's parallel development of Metal--a more efficient way to drive graphics running on the same silicon--is amplifying its improvements delivered in hardware. Because it handles both, it can optimize its new chips for its Metal software and vice versa. 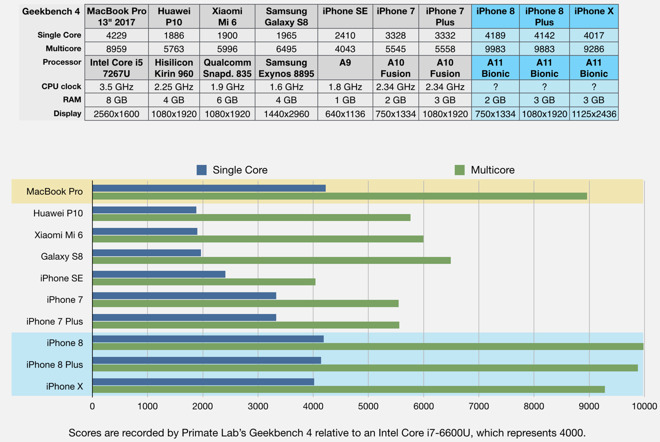 Geekbench also publishes Metal benchmarks for iOS devices that depict a new tier of performance achieved with each new generation of its technologies (below). Back in the early 1990s, Apple worked with IBM and Motorola to develop PowerPC chips that the entire PC industry was supposed to adopt as superior to Intel's. However, Intel's vast economies of scale helped it to catch up to the performance of the newer PowerPC designs and eventually surpass them. The same way that iOS has positioned Apple as "the Microsoft" of premium mobile devices, its Ax series chips have made it "the Intel" of mobile. In fact, the volume and value of iOS hardware actually make Apple far larger than the WinTel PC empire ever was. Conversely, in parallel with PowerPC Apple also worked with Acorn and VLSI to develop mobile ARM chips for its 1994 tablet. While Newton MessagePad never achieved vast economies of scale on its own, the new mobile-optimized ARM chips were picked up by Nokia and other mobile makers that created a massive market for ARM chips. A decade later, Apple's original investment in ARM was sold off by Steve Jobs at its peak valuation to help keep the company afloat while it turned itself around. When Apple began building iPods, it could tap into modern ARM chips being built by Samsung. iPod sales climbed into a mass market that allowed ARM to resist competition from rivals such as Nvidia's mobile Tegra. After sales of ARM-powered iPhones took off in even larger sales volumes, even strident efforts by Intel to enter the mobile market proved to be impossible. Since the 2010 introduction of A4, its first custom ARM design, Apple has increasingly fed its hardware profits into proprietary advanced silicon, allowing it to differentiate its offerings and avoid paying a third party. With A11 Bionic, that effort has gained a new dimension with Apple's own entirely new GPU architecture, which it formerly licensed from Imagination. Rather than any signs of slowing down, it looks like Apple's silicon gap is growing wider.